Twist & lock into position, no need to drill tiles / walls. Extendable from 1200mm to 2200mm. 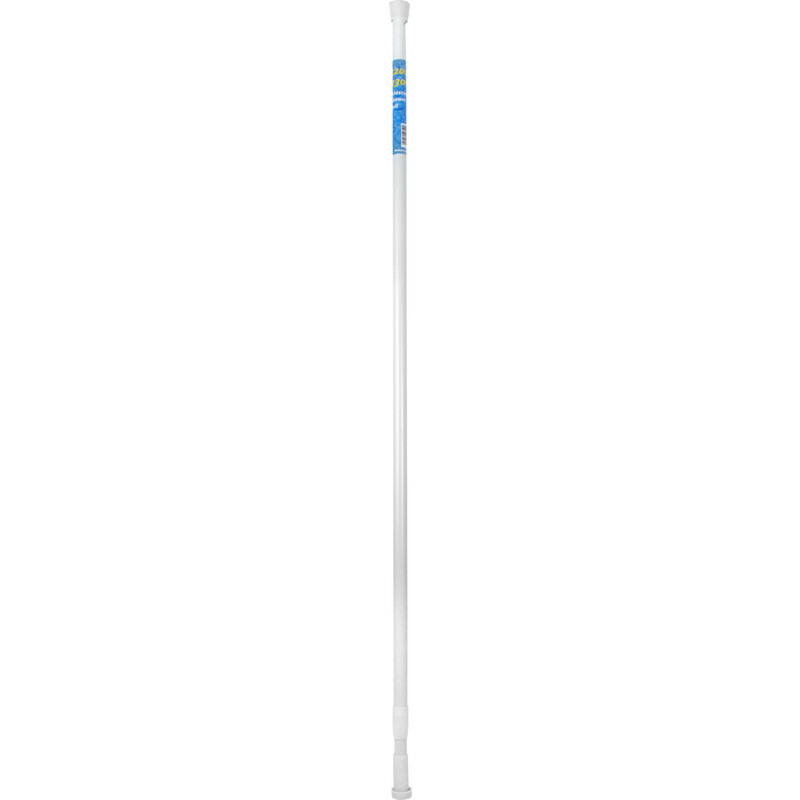 Telescopic Shower Rail White is rated 3.8 out of 5 by 21. Rated 5 out of 5 by Mivvi71 from Very good for the price For what it cost, you can’t complain. It’s probably not the strongest pole about but it’s only got to hold a shower curtain up and does this job fine. Rated 5 out of 5 by TinkyTonk from Looks good - works well. Bought this last week and it has complemented our newly decorated bathroom perfectly. We removed out shower screen as invariably they always allow water spray over floors and we prefer curtains. The only downside of my purchase is that the young female assistant in the shop was rude and dismissive to me for no reason. Perhaps she prefers to deal only with male customers? Very disappointing and have never experienced this in the Swindon branch. Rated 5 out of 5 by John 123456789 from Does the job Simple to use, went straight up, twist done. Does the job. Rated 3 out of 5 by SueP from Cheap and adequate, but basic design flaw It seems sturdy and sufficiently robust, although I've not tried it with a curtain yet. It telescopes in 2 pieces with a twist lock. There is rubbery material over the ends, so not expecting damage to the surfaces. There is a spring in one end-piece, and this is the basic design flaw. The spring is too stiff. So when you've fixed the length to slightly longer than your gap, it's almost impossible to compress the spring to get a tight fit. Instead the twist lock tends to give and the rail shortens again. It is possible to get it jammed into the gap, but it wouldn't take much (a less stiff spring) to make it much better for the same price. It's only a cheap stop-gap for me (pun intended).